Are you looking for corporate event ideas? Hiring a close up magician is a wonderful way to introduce some fun into corporate events. A close up / table magician can provide the perfect entertainment for your company event. Magic acts as an ice breaker when your guests arrive and as a really fun piece of entertainment whilst your guests enjoy a meal. I have worked with many different companies as a magician at corporate events with attendees ranging in number from 10 to 300+, although I would advise getting a second magician for any event over 150 people. A party magician can be the perfect addition to any company celebration or Christmas party. As a close up / table magician I can offer strolling magic during the drinks reception as your guests arrive followed by table magic during a formal meal. The magic is fun and interactive. If I have advance notice of a theme or product I have occasionally been able to tailor particular effects to suit the theme/product. If you are having a sit down meal for your company party I can perform around the tables during the meal. I have worked at large events with 300+ people with another magician. At the other end of the scale I have performed for a small group of 10-15 in a hotel or once in the boss's home and presented a small parlour show. As a corporate magician I am based in York but my work often takes me to other parts of the country. If you are planning a trade show to launch a new product range, a corporate magician can help entertain your guests and generate excitement and interest that will keep your guests engaged in your event. This could involve me in a static location performing from a small table or more likely it will involve me wandering around the venue and performing strolling close up magic to small groups. For a small company "do" a parlour show is like having your own private intimate cabaret show with audience participation in the magic. I can work from a very small portable table which I will bring and set up in a small space in a corner of a room or in a bay window area. Spectators are then invited up to the front to assist with effects. The parlour show can last anything up to 2 hours. If the venue is suitable then this can be an added attraction after some table magic during the meal itself. "I booked Martin to entertain guests at the Lord Mayor of York’s Valentine Ball on 11th Feb 2012, and he did a great job. Several days later and we are still trying to work out just how he managed to do his tricks! Very nice chap, very accommodating & easy to deal with, and above all a very good magician!" Ian Savage – Lord Mayor’s Fundraising Committee. More comparisons with Dynamo at the Christmas party at Salts Mill for Arris. Easingwold Golf Club - Captain's Day 11th June 2017. I booked Martin to wander around the Golf Clubhouse during the evening of my Captain’s Day. He arrived a good hour before I had booked him and after we had met, he immediately began to wander around the tables of members on the patio who were braving the fairly strong breeze. As I was busily organising the evening’s procedures, I heard gasps, wows, shouts of “Unbelievable”, “How the devil did you do that?” and so on. 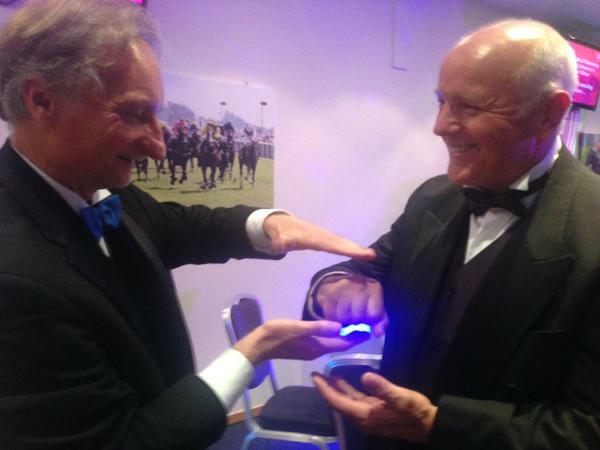 Later on in the lounge, as members returned for the Prize giving event, he sauntered from table to table showing his illusions, tricks and magic which were very varied, amazing and jaw dropping. He brings with his tricks a really pleasant and relaxed manner and people instantly like him. To sum the evening up, almost all of the members present that evening came to me later on, thanked me for a super evening and expressed their delight that I had invited Martin. He was an absolute bonus to a great day. Thanks, Martin. Leeds Rotarians host dinner for their German rotarian friends at Sandmoor Golf Club, Leeds.